The soil consultant sprayed some plots with EM to show the farmer what effect adding active soil microorganisms can have. The result was a soil that smelled sweet and exuded soil life. 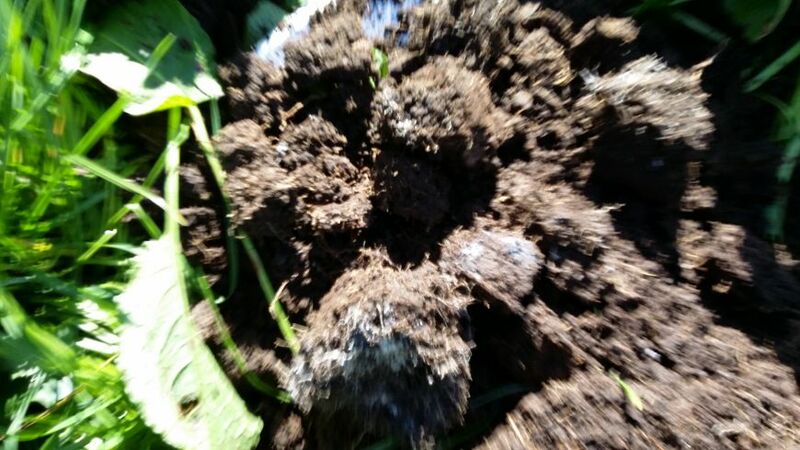 Particularly evident is Mycorrhizal fungi these specialised fungi grow on plant roots and spread far into the soil. Mycorrhizal fungal filaments in the soil are extensions of root systems and are more effective in nutrient and water absorption than the roots themselves. More than 90 percent of plant species in natural areas form a relationship with mycorrhizal fungi enhancing the plants growth performance. These fungi appear in the form of colonies of mould which start out transparent, turning white over time. The differences weren’t only seen under the soil. On top the cover looked healthier and in the many bare patches dock plants germinated. This shows that EM helped to enhance the fertility and create an environment for germination and growth. Unfortunately Docks are not as preferable as grass, however the cattle will still eat them and it provides ground cover. This also demonstrates an improvement in the soil which promoted plant growth. This application of EM would ideally have been followed with some over sowing or over drilling to seed more desirable species into the bare areas.